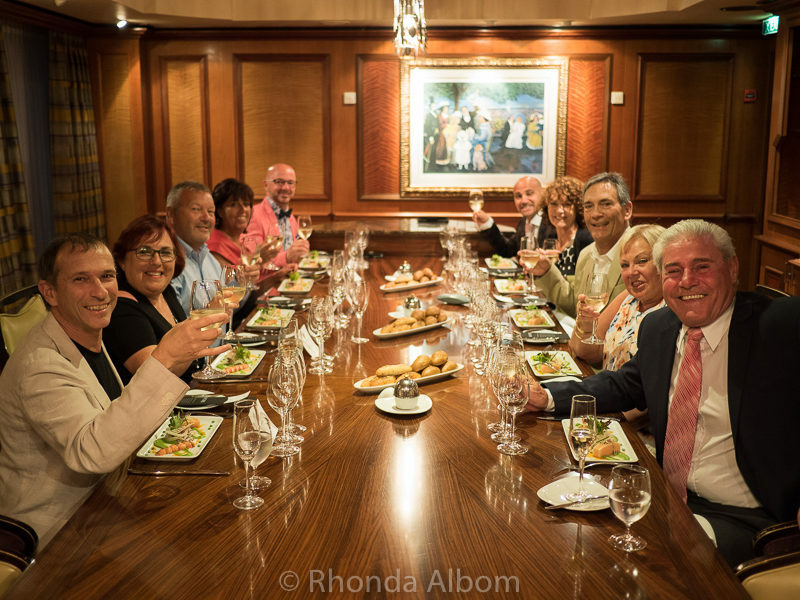 Specialty dining options have become a common feature on modern cruise ships, and the Chef’s Table on Royal Caribbean’s Radiance of the Seas is the best we have tried to date. The days of true “all-inclusive travel” are long gone. While the cost of sailing includes meals, Royal Caribbean, like the other lines we have sailed in the past few years, also offers “speciality” options for a cover charge. What you get for the extra fee is an experience. In the case of the Chef’s Table, a once in a lifetime exquisite five-course meal paired with appropriate wines. The Chef’s Table was a truly unique evening, shared with new friends. Intimate and interactive, the Chef’s Table is only available on sea days for a maximum of 16 guests per night. We had only ten at our meal. The table was immaculate, the food delicate and delicious, and the presentation resplendent. Before each of the five courses, the Chef de Cuisine whet our pallet with his detailed description of the flavours and the expert preparation methods. Then before it was served, the Master Sommelier explained his fine wine pairing for the course. 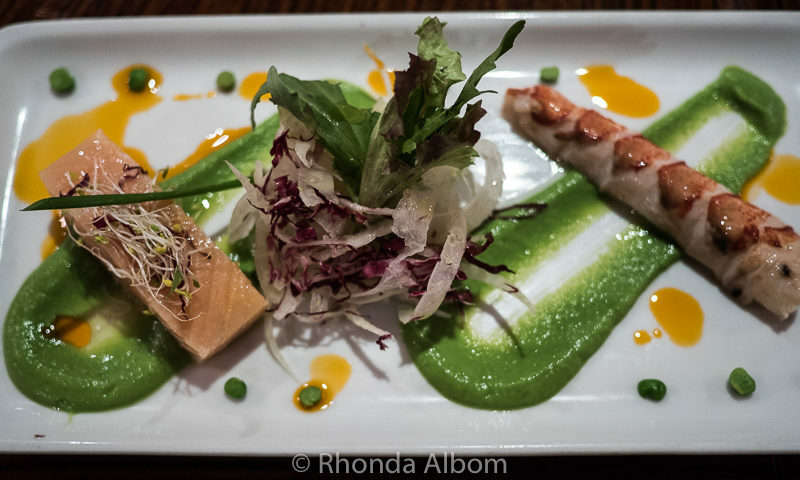 Our first course was confit of Atlantic salmon and poached lobster tail, pea puree, shellfish oil, fresh fennel and baby lettuce salad, and snow pea pods. It was beautifully paired with a sauvignon blanc from New Zealand. 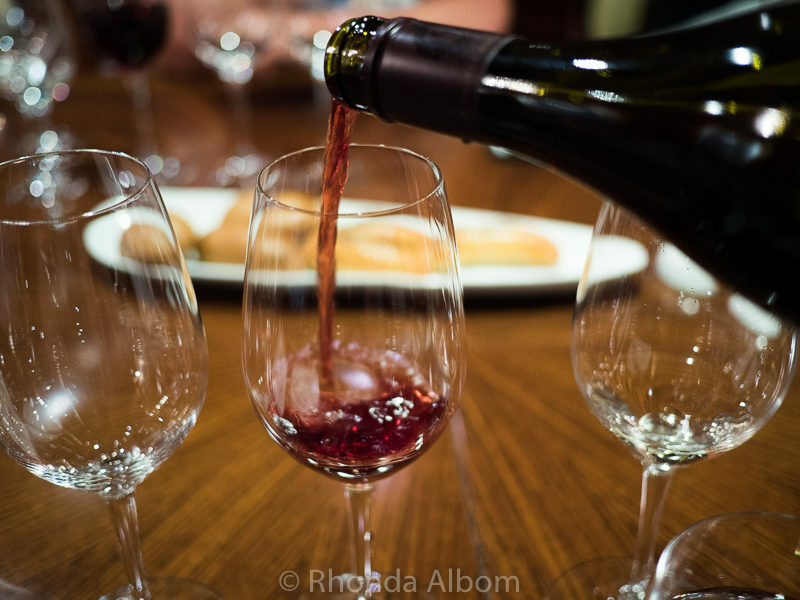 After learning a bit about the wine and why it is the perfect compliment to the soup duo, the sommelier poured us each a glass of Pinot Noir. The remainder of our courses were on par with the first. 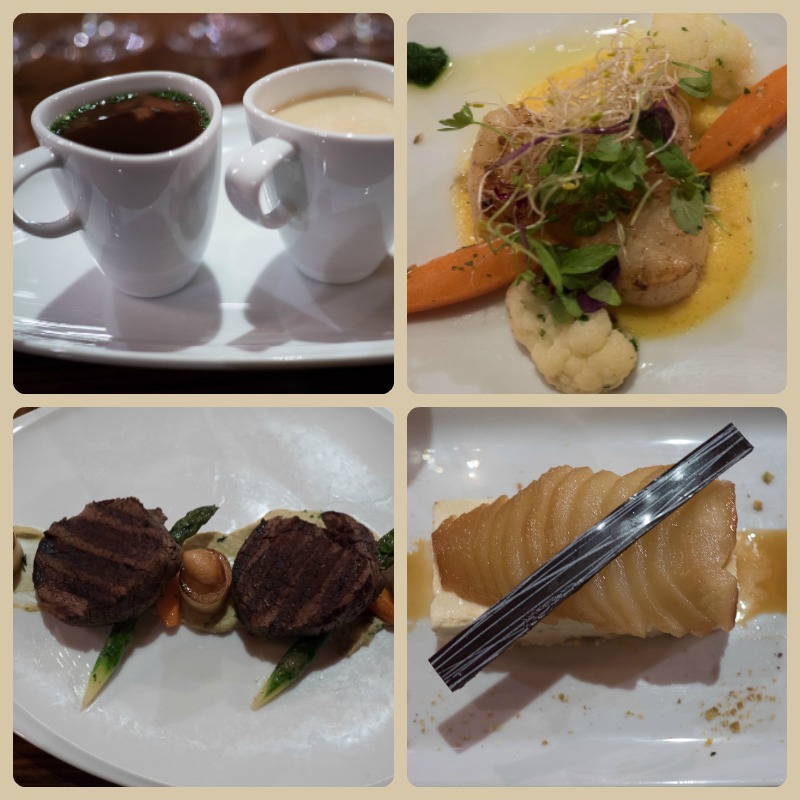 A soup duo, seared diver scallops, slow roasted beef tenderloin and caramelised pear over Nougat Montelimar for dessert completed our meal. Chef’s Table isn’t the only speciality restaurant onboard the Radiance of the Seas. There is also an Italian, a Japanese, and two different steakhouses. Each offers a more intimate dining experience than the main dining room with personal attention paid to every detail. 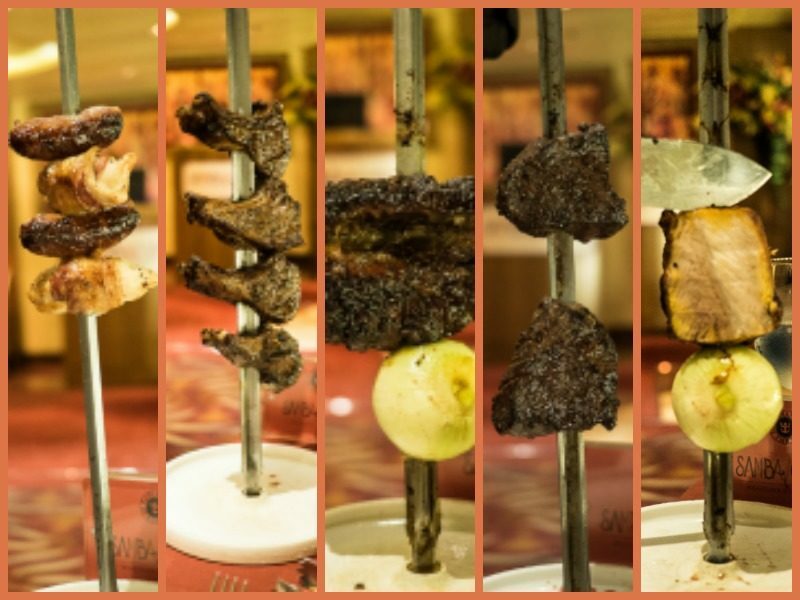 We tried Samba Grill, a Brazilian Steak House offering what I imagine to be similar to asado in Argentina. Our first course at Samba Grill was soup and/or salad. We were wisely advised to take only a bit of salad as there are lots of meats coming. The server brought each of the seven courses of meat to us on large skewers. The first of these had both sausage and bacon wrapped chicken, while the others were one by one. My favourite was the beef filet, while hubby’s was the lamb. One thing for sure, no one walks away from this meal hungry. 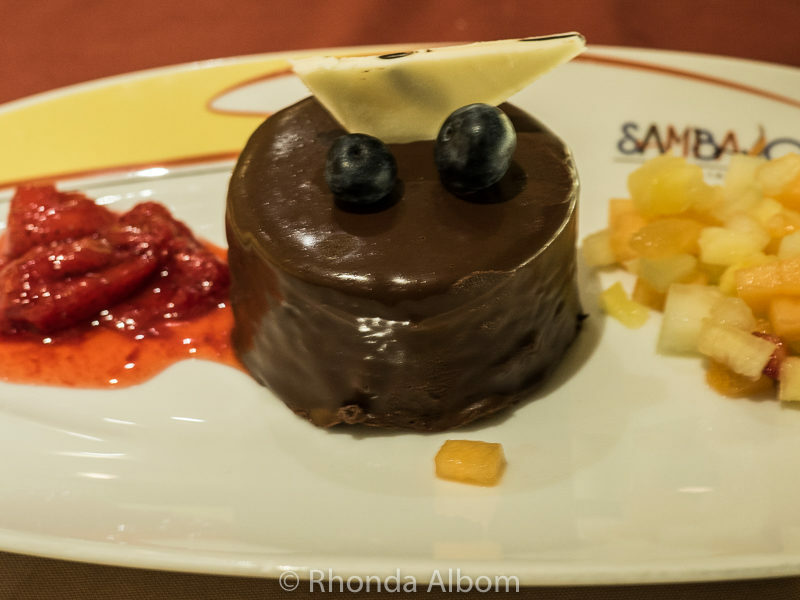 Dessert at Samba, like everywhere on the ship, was great. ⇒ Enjoy Endless Adventure and Explore the World on a Royal Caribbean Cruise! Book Royal Caribbean Cruises Today, Only at CruiseDirect.com! It is easy to enjoy all your meals onboard without incurring any extra costs. There is the main dining room serving wonderful meals three times per day. 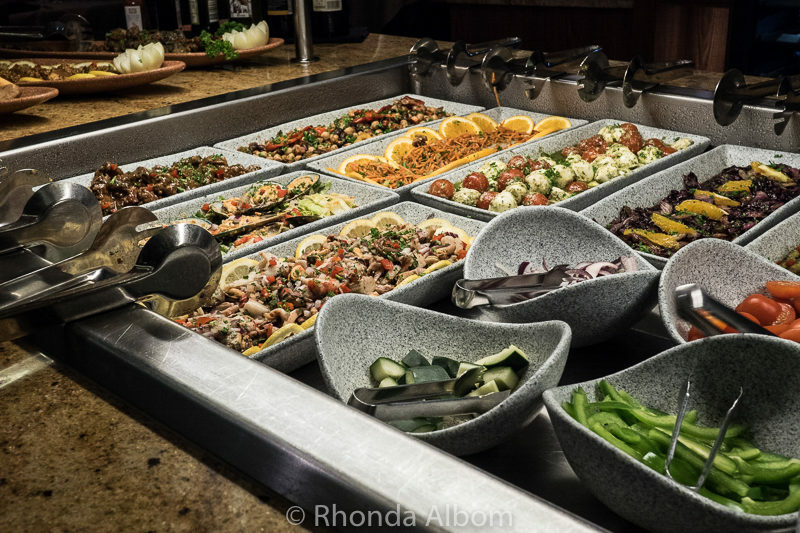 The buffet is open much of the day offering meals, snacks, sweets, and beverages. Also included in your cost of cruising is a Boardwalk Hot Dog House, Park Cafe (healthier choices), room service, and snacks at Starbuck’s coffee (The coffee is extra). This ship has filtered coffee in all the dining rooms (a vast improvement over other ships we have been on that serve a coffee syrup). 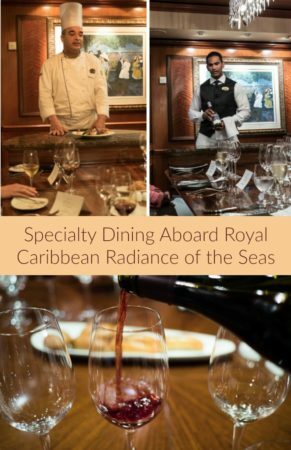 Royal Caribbean offers dinner options of traditional dining with both an early and late seating at an assigned table, or My Time dining, allowing you to either show up when you are ready for dinner or make a booking ahead of time. Guests at My Time are frequently seated at large tables of 8-10 passengers, allowing us to meet and talk to a variety of interesting people as we sail. It’s a fun feature of Royal Caribbean, but if it’s not for you, simply request a table for two. We asked for the same waiter at every meal, as he was funny, personable, and we had an instant rapport. Even better, he quickly understood my tastes and made recommendations each night that I loved. Before meeting him, I was unsure what I was going to say about the food onboard, as I had already sent back a meal. Reservations are available and often required for the speciality restaurants. You can even make them on the website before boarding if you have a special day you want to be sure to get. If you are going to try more than one speciality restaurant and are including Chef’s Table, I would recommend doing the others first, as nothing will compare to the Chef’s Table. It is a once in a lifetime treat. While I thoroughly enjoyed both of our speciality meals, I have mixed feelings on the concept of extra-cost dining. I miss the old days of cruising when everything was included. (I can say the same for the airlines.) What surprised me on this ship was the option of lobster or prime rib at dinner in the main dining room for an additional cost. I hope this is as far as the trend will go. Any more additional food charges would negatively impact the experience. Have you cruised? Did you try Chef’s Table or any of the speciality restaurants while onboard? What are your thoughts on offering a premium meal for a fee? 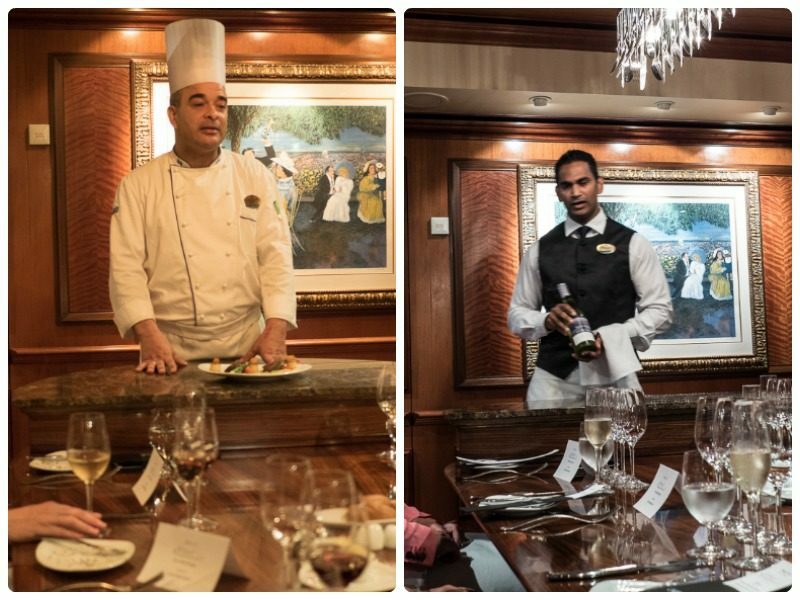 Disclaimer: In addition to VIP treatment onboard the Radiance of the Seas we were provided with many complimentary extras, including dining at Chef’s Table. The opinions expressed here are strictly my own. Really looks great! Its very easy to enjoy the meals onboad. Hmmm, now I know why my friend who regularly goes on cruises comes back having gained weight! LOL – It is a challenge to sail without gaining weight. The trick is to walk and exercise daily, and remember it is your body and your life. It all sounds fabulous and looks delicious! Rhonda, your experience at the Chef’s Table looks like you truly enjoyed yourself. The presentation of the meal is beautiful and better still, you gave it glowing praises being delicious. Everything about it was perfect, there is nothing negative to say about the Chef’s experience. It’s really funny that you mention that that is the type I food I might be eating because the next picture with all the meat on skillets is exactly how we ate asado at the restaurants I’ve went to while recently on a trip here in Argentina. I know you crossed the border, was it in Brazil or Argentina? OMG! Both the pictures and descriptions of the food is fantastic! I’d end up twice as big if I were there. All that fabulous food is just too good to pass up! Maybe you can drop by Egypt with a doggie bag of leftovers?? Sorry Lexa, there are no leftovers on my plate. Time for my diet again. Oh my … that looks great. I did a cruise many lifetimes ago and we didn’t pay for extra meals, but considering what’s on offer I don’t think I’d mind it too much as long as it didn’t get out of hand and it was a once in a lifetime kind of experience. I kind of like paying for the whole thing beforehand and just worrying about the bar tab. Have you been to Wilfire at the viaduct? I used to frequent it as I loved the Brazilian Churrasco soooo much. Every speciality meal we have experienced to date has been worth the extra money. WOW that food does look wonderful! I’d pay extra for that as well. LOL – it really was wonderful. Exciting, enthusiastic, wonderful, full but enjoyable. Way to go Rhonda. When you get off the ship? ( maybe never ) Ha,ha,ha. See ya my lovely friend. Do you indulge in any of the specialty meals when you cruise? Looks great! I guess the extra charges keep the overall cruise cost down…we stayedat a place on halpf board but you paid a supplement for certain restaurants and I was ok with that. We did 2 of them and one was so amazing, i could see why you paid more…. Very true, the overall cost of cruises is down, giving us the options to pay extra only for some of the things we want. Oh yummy. What a great way to gain a few pounds. 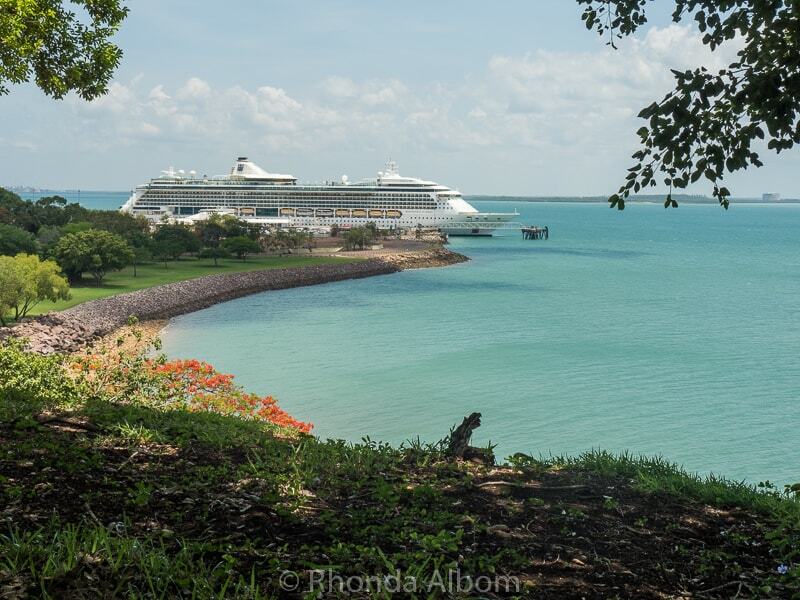 I usually gained around five pounds per cruise, even though we were in the gym every morning. We went to the steakhouse on both our cruises. Very good meals there and no big crowds. Word the money. Five pounds per cruise is pretty good. Sadly, the average is a kilo per day (that’s 2.2 pounds per day). What an exquisite experience! I’m drooling over your food photos. The chef’s meal sounds like a truly unique experience. I think anyone would eat this, except maybe a vegetarian. The food aboard a cruise is always amazing! And this particular ship is often thought of as a culinary ship. The food looks amazing. You’ve made me quite hungry and even tho it’s breakfast time, I want meat! I have dined at a Brazilian steak house that had course after course of meat and shrimp on skewers. Presentation was similar to yours. 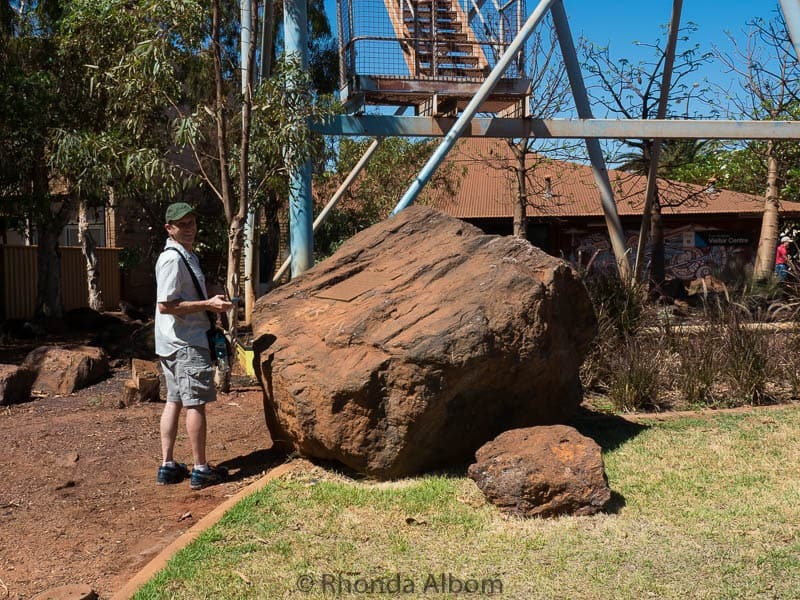 How much weight did you gain on the cruise? It was all delicious, but the Chef’s Table is really something special. That looks delish especially the lobster. I did love the lobster.